This is a professional dog clipper that has been designed to do an all-around trimming job for hair dressers. The dog trimmer has a powerful, 30 watt motor that allows you to clip the hair for long periods of time, without having to let the clipper cool. 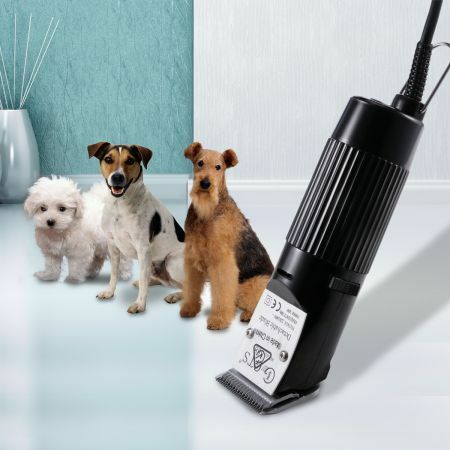 The quiet operation of the professional dog clipper helps to ease the pets by reducing the noise near their ears. The sturdy housing provides improved durability, resists harsh chemicals, and is break-resistant. With heaps of features such as removable drive-cap for easy cleaning, locking blade hinge keeps blade secure and the clipper blades snap ON and OFF for easy removal and cleaning, this professional dog clipper are the ones to pick up for your next dog grooming session. *Note: This product was designed to be used only on Pets. Package Content 1 x GTS 888 Pet Clipper. 1 x Bottle of lubricating oil. Good company to have business with.